Continuing its 32-year legacy of representing and exhibiting works devoted to contemporary fiber arts, browngrotta arts is proud to announce this year’s “Art in the Barn” multimedia group show “Art + Identity: an international view”, from April 27 – May 5. The exhibition will feature more than 50 international artists whose works are included in major museum collections around the world. With a representation of artists reflecting five continents, the exhibition will take an expansive survey of identity and art in a global world. The identity that each artist explores may be personal, political, social or cultural; it may reflect the influence of a hometown, country of birth or adoption, a place visited, or a region whose art has made an impression, an artistic or scientific movement or a broader focus on the effects globalization. Works by artists from, or influenced by, North America, South America, Europe, Asia, Africa and the UK will create an intriguing dialogue about the influence of culture, geography and personal experience and spur questions about the universality of art. The range of works will include ceramic vessels, woodblock prints, three-dimensional sculptures made of paper, wood jute, wax linen, steel and lead, and basket forms of bark and twigs, ginger and bamboo, willow and cedar. 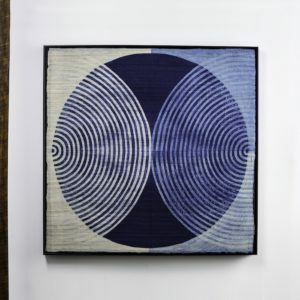 A number of artists have created wall works of linen, viscose, steel, cotton, horsehair, coconut fibers and in one case, silk, from silkworm raised by the artists. The techniques are as varied as the materials — weaving, plaiting, knotting, molding, ikat, tying, bundling, crochet, Kagami and photography. Participating artists include: Adela Akers (US), Polly Barton (US), Michelene Beauchemin (Canada), Nancy Moore Bess (US), Marian Bijlenga (the Netherlands), Birgit Birkkjaer (Denmark), Lia Cook (US), Wlodzimierz Cygan (Poland), Neha Pura Dhir (India), Lizzie Farey (UK), Paul Furneaux (UK), Mary Giles (US), Susie Gillespie (UK), Agneta Hobin (Finland), Kazue Honma (Japan), Peter and Ritzi Jacobi (Romania/Germany), Stéphanie Jacques (Belgium), Tim Johnson (UK), Christine Joy (US), Tamiko Kawata (US), Marianne Kemp (Netherlands), Anda Klancic (Slovenia), Lewis Knauss (US), Nancy Koenigsberg (US), Yasuhisa Kohyama (Japan), Irina Kolnesikova (Russia/Germany), Markku Kosonen (Finland), Lila Kulka (Poland), Kyoko Kumai (Japan), Gyöngy Laky (US), Sue Lawty (UK), Jennifer Falck-Linssen (US), Federica Luzzi (Italy), Rachel Max (UK), John McQueen (US), Mary Merkel-Hess (US), Norma Minkowitz (US), Judy Mulford (US), Nnenna Okore (Australia/Nigeria/US), Gudrun Pagter (Denmark), Eduardo Portillo & Mariá Eugenia Dávila (Venezuela), Lija Rage (Latvia), Ed Rossbach (US), Heidrun Schimmel (Germany), Brigitte Bouquin Selles (France), Naoko Serino (Japan), Sylvia Seventy (US), Jin-Sook So (Korea), Aleksandra Stoyanov (Russia/Israel), Polly Sutton (US), Chiyoko Tanaka (Japan), Hideho Tanaka (Japan), Eva Vargo (Sweden), Ulla-Maija Vikman (Finland), Wendy Wahl (US), Gizella Warburton (UK), Katherine Westphal (US), Merja Winquist (Finland), Jiro Yonezawa (Japan), Carolina Yrarrázaval (Chile). “Art + Identity: an international view” is part of browngrotta’s “Art in the Barn” series – an annual 10-day exhibition held in a barn built in 1895 and expanded and contemporized by architect David Ling. Over 3500-square feet of space with a viewing vista of 55’ allows for experiencing works that reflect complex illusionary space. The exhibition will be on view from Sunday, April 28 through Sunday, May 5 from 10am – 5pm daily. An opening reception will be held on Saturday, April 27 from 1pm – 6pm. browngrotta arts is located at 276 Ridgefield Road, Wilton, CT.
For all media inquiries, contact State Public Relations at (646) 714 – 2520 or browngrotta@statepr.com. Image credit: Neha Puri Dhir, Zazen, 2015, resist dye on silk, 41” x 41”.